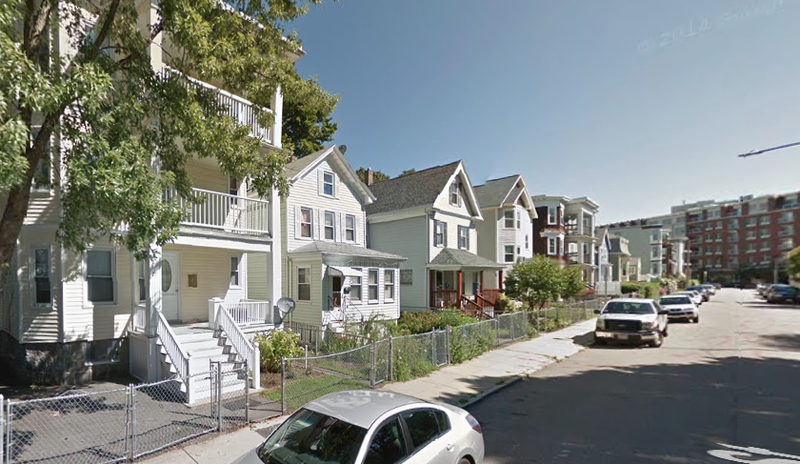 A mix of two-family and triple-decker homes on Fuller Street in Dorchester's Ashmont, just off Dorchester Avenue with the recent Carruth transit-oriented development in the distance. Image copyright Google. Typical Boston suburban streetcape: mix of large single-family houses, smaller two-family homes and even more triple-deckers, brick apartments and storefronts. How did such a varied mix of development come to be? What triggered the construction of triple-deckers and storefront shops alongside houses that are comparable in size to those on estates in Wellesley or Weston? What you are seeing is the radical effect the development of transit has had upon our city. Join me in none other than Carruth Hill in Dorchester's Ashmont neighborhood, a proud section of Boston's largest, most diverse "streetcar suburb," as I show firsthand how Boston's suburban neighborhoods developed. Through the remnants of the original Dorchester and the surrounding subsequent development, you will see for yourself how Boston's trolley system, which once had a much much greater reach than the present-day Green Line, built the suburban neighborhoods many of us live in today. The tour begins across the busway from the MBTA Red Line's Ashmont Station, in front of the Eastern Bank at the Carruth transit-oriented development. The tour lasts 90-120 minutes and ends at the MBTA Red Line's Milton Station. We will be riding the Red Line for part of the tour, so please bring T money; price of tour does not cover T fare. Rates are $12 per adult (18+), $8 per teen (13-17), $5 per child (5-12) and free for children 4 and under.